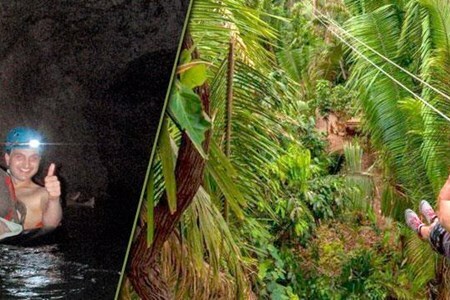 Cave tubing and zip line combination tour is for those looking for an adventure of a lifetime. There is nothing like the thrill of flying free like the birds or sitting back to enjoy ... morebeing carried lazily through mysterious caves and under the shade of nature’s lush canopy. 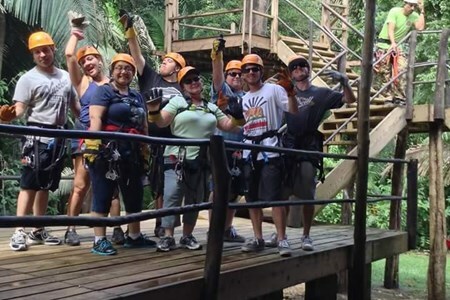 Considered one of the hottest new adventure sports and rated number 1 in Belize, the cave tubing and zip line excursion allow you to embark on every traveler’s dream adventure. 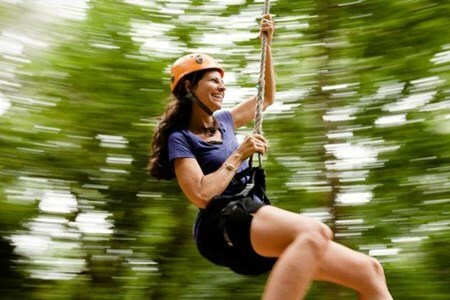 The Zip Line Adventure consists of 8 Zip Line Platforms each strategically located within the Rainforest canopy. 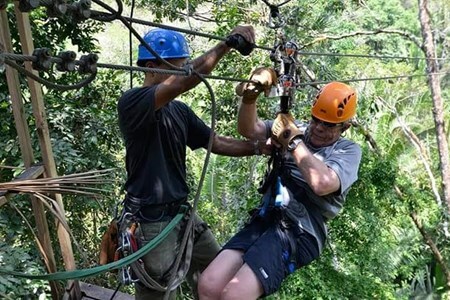 Double cables (each capable of withstanding 2, 000 pounds of weight, the requirement for this tour truly has nothing to do with weight but with the size of the safety equipment) are used for the ultimate safety. The walk to the beginning of the first Cave Entrance is a natural gentle 30 to 40-minute stroll through the beautiful Belizean Rainforest. Your guide will take you through two dry caves where many stalagmites and stalactites can be admired along the way. 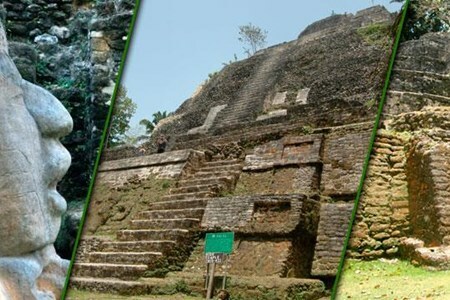 The Xunantunich Maya Ruins are by far the ruins with the most archeological importance in the country of Belize. 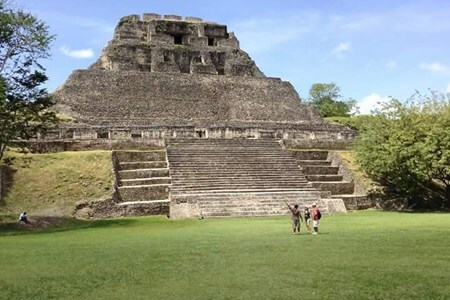 Situated in the tropical rainforest the Temples of Xunantunich are West of Belize City close to the Guatemalan border in the beautiful Cayo District. Take a canoe ride back in time and discover the mysteries of the Maya. The ancient Maya worship their gods in this pitch black cave environment. A canoe equipped with powerful spotlight ... moreilluminate the realm of the spirits. Paddle your way in and explore a cave only accessible by canoes or kayaks. JUNGLE ADVENTURES This exciting day begins as we make our way to the mainland and up the Belize River. As we ride through the river you will encounter wildlife like crocodiles, iguanas ... more& manatees while we serve a continental breakfast. Next, we board a private bus & make our way to Caves Branch. Once there it’s time to “Zip” through eight levels in the jungle. After lunch, we head to the caves, where you will put on a headlamp, hop in your individual tube and float your way through the cave system. 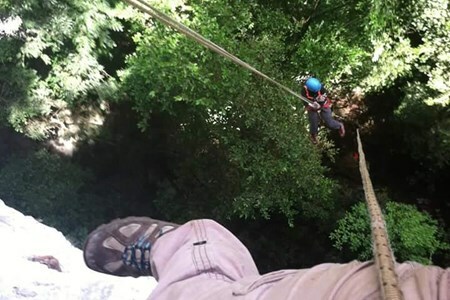 Belize Black Hole Drop is an adrenaline-filled adventure, where you rappel from over 300 feet high above at the edge of Actun Loch Tunich Cave. The roof claps thousands of years ago ... morecreating a sinkhole that overlooks the jungle canopy deep in the Belize rainforest. 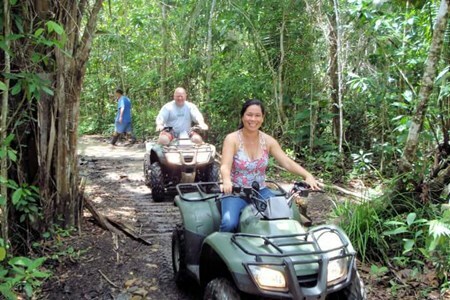 Trek through lush jungle trails to the top of the sinkhole overlooking the rainforest canopy. After gearing up in your harness and attached to ropes and pulleys, you rappel down from the edge of the sinkhole over 300 high. Go only 100 feet and you will be above the forest canopy growing up from the inside. Another 200 feet takes you down deeper into the darkness of the cave. Make it to the very bottom and feel a sense of relief when you look up to see how high you were. Take pictures of animals you only get to see in Belize. The Belize Zoo and Tropical Education Center started in 1983 with only a collection of wild animals that were used in making ... morea documentary film about tropical forests. The animals who resides here were orphaned, born at the zoo, rehabilitated animals or sent here as gifts, from other zoological institutions. You are safely transferred on one of the Water Taxi ferries to Belize City, where you will journey roughly an hour and 30 minutes through Caye Caulker, Caye Chapel, mangroves and get ... morea glimpse of St. George’s Caye before arriving the commercial City of Belize. 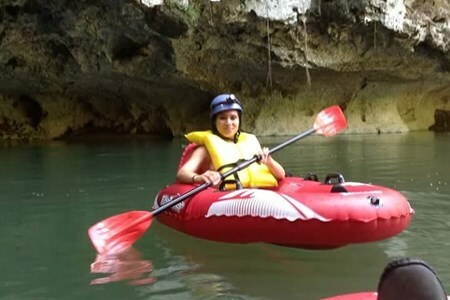 There you will be waited upon by your tour guide, who will then transfer you on a private air-conditioned vehicle to Caves Branch, your cave tubing destination. You will hike up a man-made path, and down into the cave, where your tubing adventure begins. Lunch is on us! 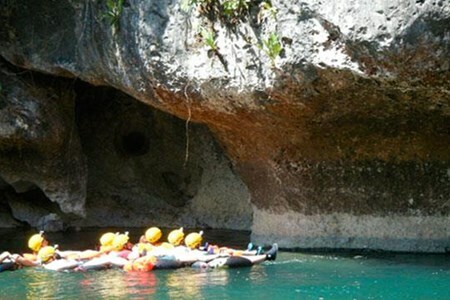 Enjoy the cave tubing, enjoy the beauty of the Belize cave systems. Emerge yourself into a maze of river branches with untouched foliage terrains that form habitats to hundreds of species of wildlife like crocodiles & spider monkeys. Feel the rush ... moreen route the New River shiftlessly flowing into the sudden openness of the New River Lagoon. A few hundred meters beyond the banks of this revealing lagoon concealed by the rainforest is Lamanai Mayan Site. 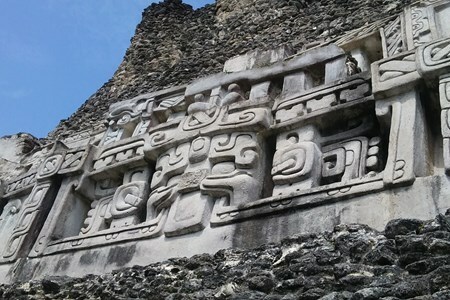 This Mayan city bears a powerful history that it still inspires the feeling of supremacy, that it once held. With about 95% of the city still remains unexposed, you can experience the sudden presence of the temples as you trail along the jungle paths. Lamanai is found within a reserve of wildlife and plants, where along the marked paths you will come across labeled trees and plants and various other wildlife creatures. The tour offers a complimentary hour & 30 minutes Water Taxi transfer to Belize City where you will journey along Caye Caulker, Caye Chapel, mangroves and get a glimpse of St. George’s Caye before arriving the commercial City of Belize where you will meet your tour guide. From there you board their private vehicle as you begin a 50-60 minutes journey on the Phillip Goldson Highway to Tower Hill. From here you get to know your captain, aboard the boat and off the amazing jungle river safari, and on your way to the Mayan City of Lamanai. A family adventure trip! With safety as a priority, we welcome children and also non-swimmers to this educational combo cave tubing Belize trip to learn about the caves and the native ... morewildlife at the Belize Zoo. Our Belize cave tubing is done at Caves Branch, with all the gear included. We have gear catered for all ages and size, including life jackets and inner tubes built tough for maximum safety. Your guide will be with you along the entire tubing journey, pointing different features of the caves like the crystal formations hanging from the ceiling. 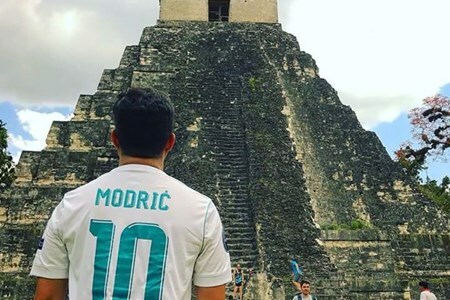 You will also get to see remains of Mayan artifacts, tools and secret chambers where the Mayans used to perform various rituals. 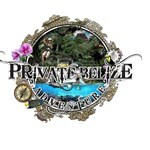 The Belize Zoo is Belize’s tropical educational center and rehabilitation center for numerous native wildlife. This nature nirvana hosts over 150 animals of 40 different species. The tour offers a complimentary hour & 30 minutes Water Taxi transfer to Belize City where you will journey along Caye Caulker, Caye Chapel, mangroves and get a glimpse of St. George’s Caye before arriving the commercial City of Belize where you will meet your tour guide. From there you board their private vehicle as you begin the scenic journey on the George Price Highway to Caves Branch. 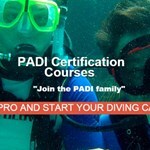 After a brief introduction to your guide, gear and instructions you undertake the most amazing cave tubing experience there is. Join us for an unforgettable Cave Tubing Combo. 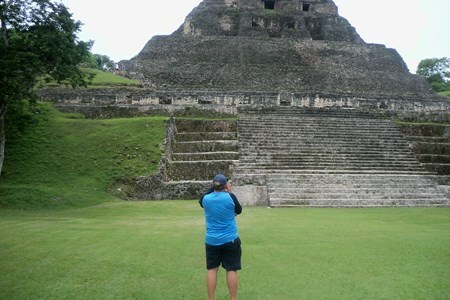 Altun Ha is an ancient Mayan City about 30 miles north of Belize City, dating back to about B.C. 900. It is believed the city was occupied for centuries up until A.D. 1000, covering ... morethe classic period A.D. 250-900, the time from which most of the information of this city was gathered and the time when the city was at its height. The name Altun Ha means “Rockstone Water”, and it is derived by the name of a nearby village called Rockstone Pond, but Altun-Ha’s ancient name remains unknown. 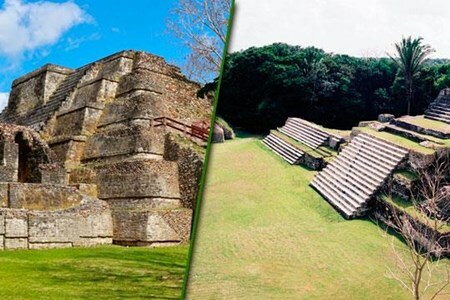 The largest temple of Altun Ha is the Temple of the Masonry Altars which stand 54 feet high. The Sun God’s Tomb is also found on this temple dated for about A.D. 600-650, in which researchers found a skeleton and various artifacts when the tomb was excavated. The tour offers a complimentary hour & 30 minutes Water Taxi transfer to Belize City where you will journey along Caye Caulker, Caye Chapel, mangroves and get a glimpse of St. George’s Caye before arriving the commercial City of Belize where you will meet your tour guide. 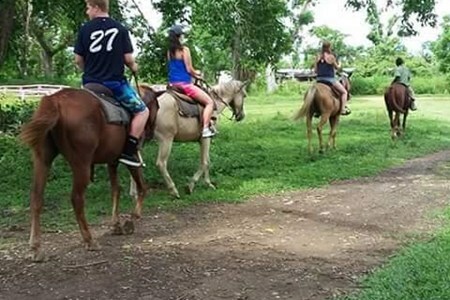 From there you board on a private vehicle with your guide as you begin your road trip to Altun Ha. 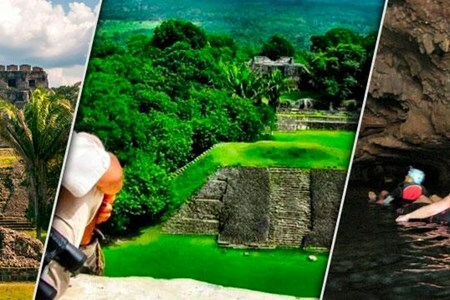 Let us take you on a journey back to the age of the pre-Columbians, an age where these Mesoamerican regions were once tamed by the Mayans. 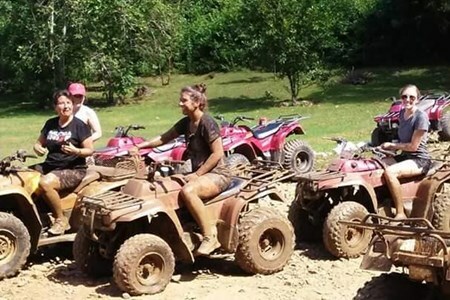 Among these regions, on the native ridges ... moreof Belize, you can embark on an exploration of Mayan Ruins and cave systems on one single tour. Just about 80 miles west of Belize City, endures Xunantunich, an Ancient Maya archaeological site that majestically stands at the summit of a mountain giving a dominant view of the entire site and region. 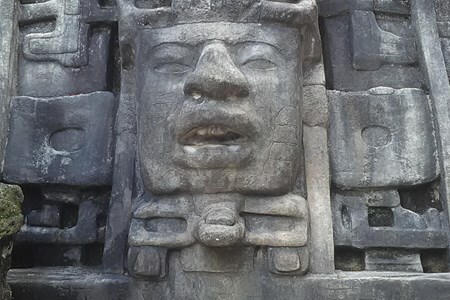 The Mayans made use of the land and it’s terrains, as they did so above the surface they also did so below the surface. The Mayans believed that the caves were an entrance to Xibalba “a place of fear” related to death. It is completely so because the Mayans used the caves to perform death rituals and also the river flowing through these caves provided a secret passageway to ambush enemies. 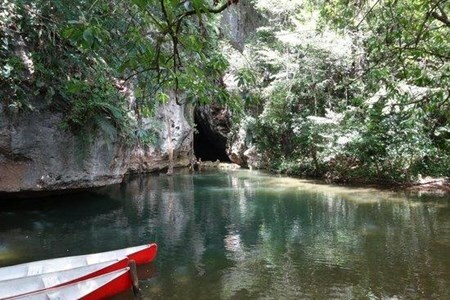 Which brings us to your next stop of the trip, Cave Tubing into a cave system at Caves Branch. 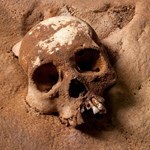 Inside the caves, you will encounter remains of ancient artifacts, tools and also secret chambers. 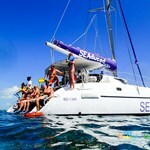 The tour offers a complimentary hour & 30 minutes Water Taxi transfer to Belize City in which you will journey along Caye Caulker, Caye Chapel, mangroves and enjoy a glimpse of St. George’s Caye before arriving the commercial City of Belize where you will meet your tour guide. From there you board on a private vehicle with your guide as you begin your road trip on the George Price Highway to Xunantunich. You will get enough time to explore the entire courtyard, the Temples and also visit the on-site museum and gift shop before it is time to head back on the highway to Caves Branch. Caves Branch is renowned for it’s impressive Cave Tubing adventures and also it’s thrilling zip line.